This Mac DVD Burner can not only burn video to DVD disc that will playback in any DVD player or computer's DVD drive, but also can create ISO files, which are suitable for virtual drive user. 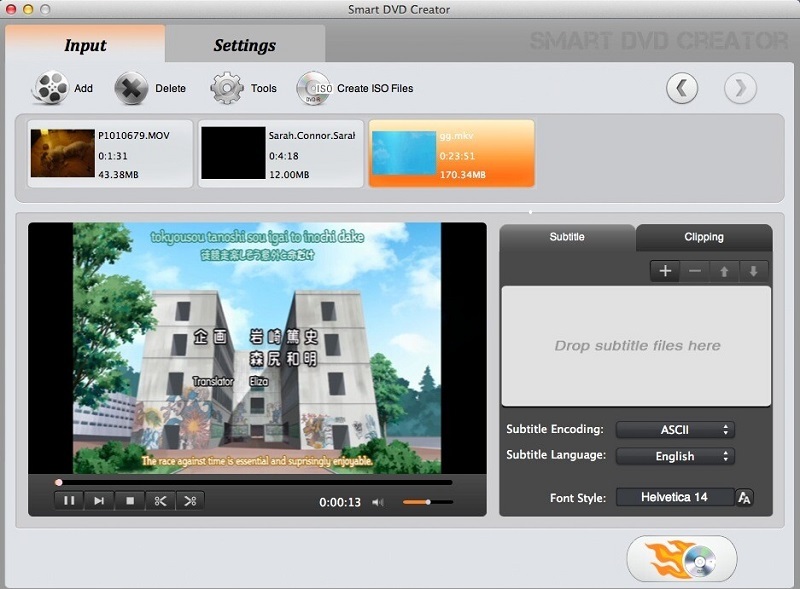 Beside, Smart DVD Creator for Mac edit videos using tools like trim, crop,merge,etc. Moreover, the DVD Burner for Mac full version can add multiple subtitles to your videos, then burn them to DVD discs or ISO files. You can use the Mac DVD Burner to Burn DVDs and Create DVD Files Effortlessly. The intuitive Mac-style interface lets you easily import a few video clips, and burn them to DVD disc effortlessly.The DVD Creator support to burn DVD with ultra-fast speed but without loss DVD quality. 7.Convert downloaded videos and movies from YouTube, Google,etc. to DVD. 11.Highly compatible with DVD-5, DVD-9, DVD-R, DVD+R, DVD-R DL, DVD+R DL, DVD-RW, DVD+RW.